No. 963 is a 250°F, electrically-heated, vertical conveyor oven from Grieve. Workspace dimensions of this oven measure 30" W x 65" D x 83" H. 30 kW are installed in Incoloy-sheathed tubular elements to heat the oven chamber, while a 6000 CFM, 5-HP re-circulating blower provides vertical upward airflow to the workload. 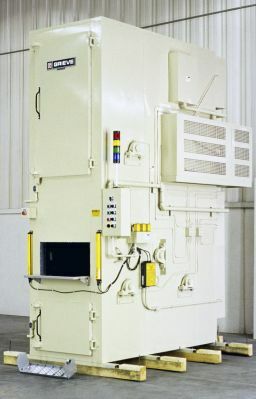 This Grieve vertical conveyor oven features 4" insulated walls, aluminized steel exterior and interior, top-mounted heat chamber, two independent doors for access to the workspace and heat chamber, plus 25 product trays, each 24" wide x 6" long, supported at each side by heavy-duty roller chain and driven by a ¾-HP drive motor, controlled by a variable frequency drive. No. 963 controls include a digital indicating temperature controller, re-circulating blower airflow safety switch, manual reset excess temperature controller with separate contactors and a tower light to indicate machine status. The oven is built to JIC/NEMA 12 electrical standards.